The greatest adventure of a 12-year-old boy ever told. The Whatever Chronicles follows the tale of an unlikely young man as he's suddenly thrust into the role of the Chosen Hero, after waking from a dream and being stuck with the task of saving the world from total annihilation by the hands of a great Celestial Evil that once threatened it long ago. Being the free-spirit he is, the Hero willingly accepts out of a lack of anything better to do. Along the way, Hero will meet many friends who will help him bear the heavy consequence of the Chosen Hero's quest, as well as many foes who would stop him at all costs from preventing the return of the great evil that once plagued the land. This comic contains heavy doses of turtles, psychotic moms, chocolate, explosions, sea monsters, heroism, wildebeests, and beef jerky. CAUTION: The Whatever Chronicles features some minor adult language that may not be suitable for little kids or big babies. If you don't like that kind of thing, you'd best be high tailing it back the way you came, pard'ner. Rose City Comic Con 2018! I'll be tabling at Rose City Comic Con 2018! Hey everybody! 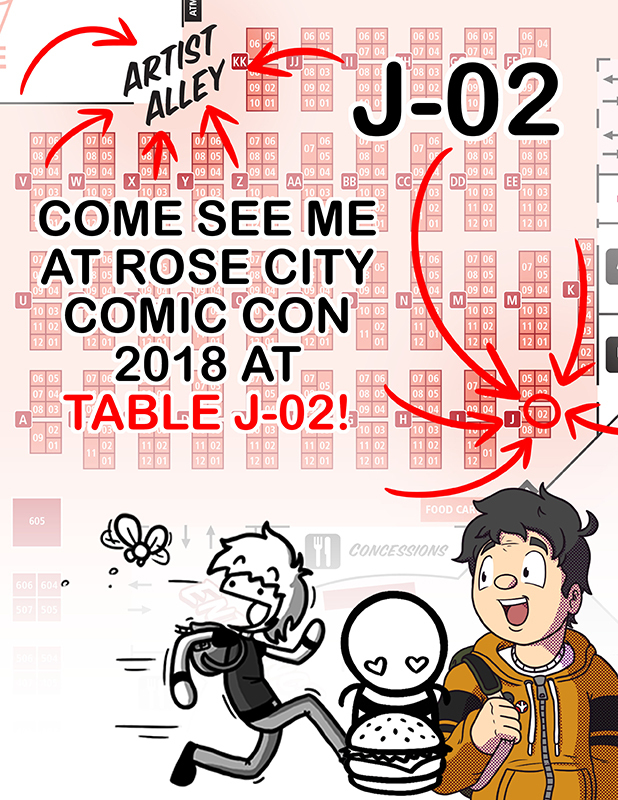 It's been a while since I've posted any news related content here, but I wanted to drop by and let you all know I'll be tabling in the Artists Alley (Table J-02) at RCCC this year! If you're around the Portland, Oregon area between September 7th - 9th, be sure to drop by and say hello! I'll mostly be promoting my webcomics there, but I'll have original art prints and other physical goodies for sale as well! I'd love to see you there! Hey guys, it's been a solid year since I've posted any news here! I've been continuously posting TWC without a whole lot else to say, but today I've got an update for ya! After going through some of the original TWC strips, and noticing how unpleasant they are to read/look at (I was still getting my sea-legs with how to draw this darn thing and my handwriting was atrocious), I've decided to do a restoration of the first 113 strips in this series! Strips 1-21 will be completely redrawn in the proper resolution so it is easier to read, as well as being more consistent and on model with the way the rest of the comic looks. The handwritten font will also be removed and replaced with my custom typed font I started using in Strip 114 and onward. Strips 22-113 will still have the same art as before, but will have their handwritten font replaced with the typed font as well. The reason behind this is that this project has become a staple in what I do on a regular basis as an artist, and I intend to make a bigger point of promoting it and showing it off to new people. I still intend to be working on this project for the next 2 years or more at least, so I owe it to myself to give it a facelift and make it as enjoyable to read as possible from beginning to end. In other news, I will be exhibiting at the Small Press Expo in Bethesda, Maryland in September! This will be my first time at this convention, and I'm beyond excited to showcase The Whatever Chronicles, as well as my other graphic novel and illustration based work! If you plan on being there, I'd love to see you! Lots to prepare for, but I wouldn't have it any other way. See you guys next time! Hey gang, I'll be holding an artist's booth tonight and tomorrow at The Tangent Gallery here in Detroit showcasing my larger body of work. Due to all the craziness with getting set up for this event and for all my end of the year school responsibilities starting to pile up, I won't actually be updating today or Monday. May or may not have to close up shop until the school year is over like I did the year prior, I'll keep you guys posted! Until then, wish me luck! Howdy everyone, just dropping a note here that there won't be an update tomorrow, got some commission work that needs to get finished and there's homework that I still need to attend to for a class. Thanks so much for your patience, I'll see ya on Friday! No Update on New Years Day, Whoops! Sorry gang, meant to let you all know that I wasn't going to be updating on New Years Eve, I was throwing a party with family and friends back home. You'll see another comic on Monday, Happy New Year everybody! Hey gang, hope your holiday celebrations went well, and much wall turkey was consumed. This week is looking to be a bit crazy for me. I've got a handful of commission jobs to finish up, as well as a school project deadline to meet at the end of the week. To top it off, I'll be selling a bunch of my work at an event Saturday night, so up until then, I'll be beyond busy. Unfortunately, this means I won't have the time to update today or Friday, but I promise I'll be back to updating next Monday, so keep your spirits up! Thanks for understanding guys, have a good one! Sorry Gang, No Post Friday Due to Prior Engagements! Hey gang, I'll be posting an 8-panel strip this upcoming week, but due to school starting up and having some academic responsibilities to take care of already, I'll be postponing the update until Friday, the 18th. Thanks for understanding, I've got some cool stuff happening in the comic real soon that I'm insanely excited for, so keep your eyes peeled! Love you guys!